The Civic has been Canada’s best-selling car for 21 years in a row! If that alone isn’t enough to convince you to at least take one for a test drive, how about knowing that it comes in a sedan, coupe, or hatchback? Or that it now includes available features like the 7” Display Audio System, proximity entry system, and standard multi-angle rearview camera? What about the fact that the Civic is manufactured right here in Canada–in Alliston, Ontario to be exact? Or maybe that for 2019 it has so far won Kelley Blue Book’s Overall Best Buy Award, Auto Trader’s Overall Top Pick Award, and a IIHS Top Safety Pick award? Oh, did we mention that it’s legendary for its fuel efficiency and long term durability. If we’ve finally got you convinced, visit our New Vehicle Inventory department to get specs on the latest Civic, use our Build & Price tool to compare models or come chat with us in person. We’re the Civic go-to destination for everyone in the Moose Jaw, Swift Current, Regina and surrounding regions. The 2018 Honda Civic comes with two different engines that can be paired with the smooth and efficient CVT (Continuously Variable Transmission). The first option offered is the 158 HP/138 ft-lbs of torque 2.0-litre, 16-valve, Port Injection, DOHC, i-VTEC® 4-cylinder engine. This option is standard for the DX, LX, and EX trim levels on both the sedan and coupe. The other engine option for the 2018 Honda Civic is the 174 HP/162 ft-lbs of torque 1.5-litre, 16-valve, Direct Injection, DOHC, turbocharged 4-cylinder engine. This engine is offerd exclusivly to the EX-T and Touring class models for the sedan and coupe, and offered on all three trim levels of the hatch . The customer seeking a sportier vehicle can opt to buy a Civic with a 6 speed manual transmission in both the DX and LX models of the sedan model. All models feature ECON push button mode for best fuel efficiency. You’ll feel like you’re driving a race car. 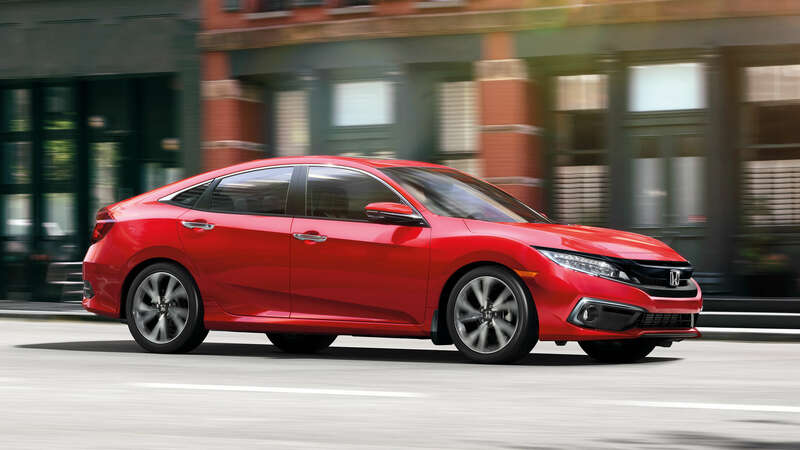 The sedan and coupe’s Si model offers textured metal gas, brake, and clutch pedals, race car inspired black and red seats and side bolsters for security. The Intelligent Multi-Information Display feature relays important information to you, like your current fuel efficiency and trip range. Never fumble with your keys again when the proximity entry system unlocks your door as it senses your approach. Once inside, turn the car on with a simple push of a button. The available 7-inch Display Audio System with HondaLink mimics a tablet so you can easily swipe, pinch, and tap through your audio system, navigation, and personal settings. This year’s Honda has more safety systems than ever. Of course it comes with six standard airbags, 3-point front and rear seatbelts, childproof rear door locks and LATCH child-seat restraints, but there’s more. Don’t worry about any surprises with the available LaneWatch Blind Spot Display and standard multi-angle Rearview Camera. Maintain control with the 4-wheel Anti-lock Braking System, Hill Start Assist, and Vehicle Stability Assist with Traction Control. The powerful Next Generation ACE body structure disperses impact energy to help protect occupants during a collision, and the available HondaLink Assist Automatic Emergency Response System gets you help by putting you through to an operator who can forward your location to emergency personnel if you need it. Your Honda is just begging for you to deck it out. Western Honda can help you do that with performance parts and accessories, along with parts for any tune ups you might need. Check out our parts department or order your parts online.